Over the weekend, we cheered (and shed a tear or two) as Iza Calzado got engaged to her boyfriend of five years, Filipino-British businessman Ben Wintle. It took Ben a month to plan his proposal for Iza in Sonya's Garden, Tagaytay, which happened on Sunday, October 8. He treated their close family and friends to an intimate lunch right after popping the question that made the 35-year-old actress nod a tearful yes. But, apparently, there's more to the proposal that we don't know of! The bride-to-be took to Instagram to show a cute bit of her soon-to-be-husband reciting his proposal speech in Tagalog. 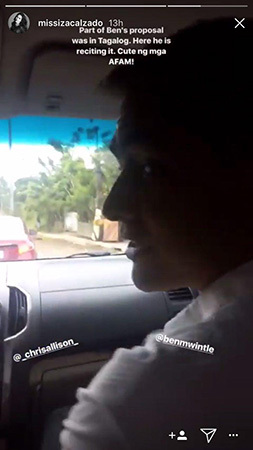 In Iza's IG Story, she shared a short clip of Ben inside the car with friend Chris Allison (celebrity stylist Pam Quinones' husband). In the caption, Iza joked, "Part of Ben's proposal was in Tagalog. Here he is reciting it. Cute ng mga AFAM." The clip shows Ben trying his best to utter this line in Tagalog: "Gusto kitang makasamang kumain at sumayaw habang buhay." If that's not a line that would make any girl say yes, we don't know what will!